Sphecius speciosus, often simply referred to as the cicada killer or the cicada hawk, is a large digger wasp species. Cicada killers are large, solitary wasps in the family Crabronidae. The name may be applied to any species of crabronid which preys on cicadas, though in North America it is typically applied to a single species, S. speciosus. 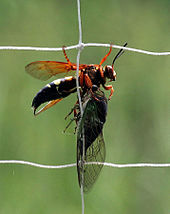 However, since there are multiple species of related wasps, it is more appropriate to call it the eastern cicada killer. This species occurs in the eastern and midwest U.S. and southwards into Mexico and Central America including Louisiana. They are so named because they hunt cicadas and provision their nests with them. In North America they are sometimes called sand hornets, although they are not hornets, which belong to the family Vespidae. Cicada killers exert a measure of natural control on cicada populations and thus may directly benefit the deciduous trees upon which their cicada prey feed. The most recent review of this species' biology is found in the posthumously published comprehensive study by noted entomologist Howard Ensign Evans. Adult eastern cicada-killer wasps are large, 1.5 to 5.0 centimetres (0.6 to 2.0 in) long, robust wasps with hairy, reddish and black areas on the thorax (middle part), and are black to reddish brown marked with light yellow stripes on the abdominal (rear) segments. The wings are brownish. Coloration superficially resembles that of some yellowjacket and hornet species. The females are somewhat larger than the males, and both are among the largest wasps seen in the Eastern United States, their unusual size giving them a uniquely fearsome appearance. European hornets (Vespa crabro) are often mistaken for Eastern cicada killers, though at about 3.5 centimetres (1.4 in) long they are smaller than the largest cicada killers. The males are smaller than the females because the females must carry the cicadas they have killed to a burrow for nesting; whereas, the males do not need to carry their prey. This female cicada killer landed in the grass after becoming tired while carrying a cicada in flight and landed short of her burrow. Solitary wasps (such as the eastern cicada killer) are very different in their behavior from the social wasps such as hornets, yellowjackets, and paper wasps. 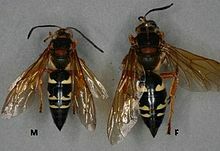 Cicada killer females use their sting to paralyze their prey (cicadas) rather than to defend their nests; unlike most social wasps and bees, they do not attempt to sting unless handled roughly. Adults feed on flower nectar and other plant sap exudates. 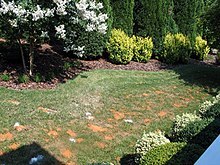 Cicada killer infestation: the reddish brown patches are cicada killer burrows. This ground-burrowing wasp may be found in well-drained, sandy soils to loose clay in bare or grass-covered banks, berms and hills as well as next to raised sidewalks, driveways and patio slabs. Females may share a burrow, digging their own nest cells off the main tunnel. A typical burrow is 25–50 centimetres (10–20 in) deep and about 1.5 cm (0.59 in) wide. In digging a burrow, the female dislodges the soil with her jaws and, using her hind legs, pushes loose soil behind her as she backs out of the burrow. Her hind legs are equipped with special spines that help her push the dirt behind her. The excess soil pushed out of the burrow forms a mound with a trench through it at the burrow entrance. Cicada killers may nest in planters, window boxes, flower beds or under shrubs, ground cover, etc. Nests often are made in the full sun where vegetation is sparse. After digging a nest chamber in the burrow, female cicada killers capture cicadas, paralyzing them with a sting. After paralyzing a cicada, the female wasp holds it upside down beneath her and takes off toward her burrow; this return flight to the burrow is difficult for the wasp because the cicada is often more than twice her weight. A wasp will often lug its prey up into the nearest tree, to gain altitude for the flight to the burrow. After putting one or more cicadas in her nest cell, the female deposits an egg on a cicada and closes the cell with dirt. Male eggs are laid on a single cicada but female eggs are given two or sometimes three cicadas; this is because the female wasp is twice as large as the male and must have more food. New nest cells are dug as necessary off of the main burrow tunnel and a single burrow may eventually have 10 or more nest cells. The egg hatches in one or two days, and the cicadas serve as food for the grub. The larvae complete their development in about 2 weeks. Overwintering occurs as a mature larva within an earth-coated cocoon. Pupation occurs in the nest cell in the spring and lasts 25 to 30 days. There is only one generation per year and no adults overwinter. This wasp is frequently attacked by the parasitic "velvet ant" wasp, Dasymutilla occidentalis, also known as the "cow-killer" wasp. It lays an egg in the nest cell of the cicada killer, and when the cicada killer larva pupates, the parasitoid larva consumes the pupa. Although cicada killers are large, female cicada-killer wasps are not aggressive and rarely sting unless they are grasped roughly, stepped upon with bare feet, or caught in clothing. One author who has been stung indicates that, for him, the stings are not much more than a "pinprick". Males aggressively defend their perching areas on nesting sites against rival males but they have no stinger. 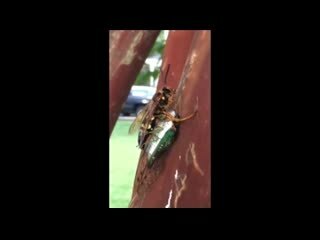 Although they appear to attack anything that moves near their territories, male cicada killers are actually investigating anything that might be a female cicada killer ready to mate. Such close inspection appears to many people to be an attack, but male and female cicada killers do not land on people with the intent to sting. If handled roughly, females will sting, and males will jab with a sharp spine on the tip of their abdomen. Both sexes are well equipped to bite, as they have large jaws, but they do not appear to grasp human skin and bite. They are generally not aggressive towards humans and usually fly away when swatted at, rather than attacking. Sphecius convallis, the Pacific cicada killer, occurs in the western U.S. and in Mexico. Sphecius grandis, the western cicada killer, occurs in the mid- and western U.S. and in Mexico. Sphecius hogardii, the Caribbean cicada killer, occurs in the U.S. in Florida and in the Caribbean. It is suspected that the western cicada killer represents more than one species. There is also evidence to suggest that the eastern cicada killer has either a subspecies or a closely related species that mimics the Pacific cicada killer. Alternatively, when they were already distinct species, significant hybridization has occurred between them, though not enough to fully overcome their present reproductive isolation. The spectacled cicada killer, Sphecius spectabilis (Taschenberg, 1875), is found in the South American countries of Argentina, Bolivia, Brazil, Chile, Colombia, French Guiana, Paraguay, Surinam and Venezuela. Sixteen other cicada-killer wasp species in the genus Sphecius are found in Europe, the Middle East, Africa and Asia. There are also other genera of cicada-killing wasps (e.g., Liogorytes in South America and Exeirus in Australia) which are the "cicada killers" of their native lands. ^ Howard Ensign Evans & Kevin M. O'Neill (2007). The Sand Wasps: Natural History and Behavior. Harvard University Press. pp. 37–43. ISBN 978-0-674-02462-5. ^ Coelho, J. R. (1997). "Sexual size dimorphism and flight behavior in cicada killers (Sphecius specio- 5M5)". Oikos. 79: 371–375. doi:10.2307/3546021. ^ Holliday, C. W.; Coelho, J. R. (2006). "Improved key to New World species of Sphecius (Hymenoptera: Crabronidae)". Annals of the Entomological Society of America. 99: 793–798. doi:10.1603/0013-8746(2006)99[793:IKTNWS]2.0.CO;2. ^ Coelho, Joseph R.; Hastings, Jon M.; et al. (January 2008). "Sexual Dimorphism of the Femora, Tibiae, and Hind Tibial Spurs in the Eastern Cicada Killer, Sphecius speciosus Drury (Hymenoptera: Crabronidae) in the United States". Entomological News. 119 (1): 11–18. doi:10.3157/0013-872X(2008)119[11:SDOTFT]2.0.CO;2. ^ Joseph R. Coelho (1998). "Cicada killer control". Archived from the original on August 28, 2008. Retrieved July 18, 2008. ^ Hastings, Jon M.; Schultheis, Patrick J.; et al. (2008). "DNA barcoding of new world cicada killers (Hymenoptera: Crabronidae)" (PDF). Zootaxa. 1713: 27–38. Retrieved 20 May 2018. Wikimedia Commons has media related to Sphecius speciosus. Sphecius is a comprehensive list of taxonomic information on the genus. The original version of this heavily edited article was a copy of a fact sheet from the Ohio State University Extension.